I would like to thank everyone for their contribution, participation and support in the recent tour I completed in the Maritimes. All of the events were extremely satisfying and successful, exceeding whatever expectations I had for them. 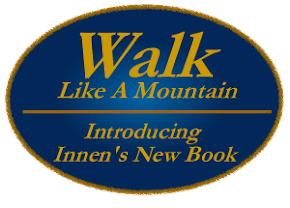 I very much appreciated the interest in Walk like a Mountain, and the emergence of Tendai Buddhism in Canada. Each of the events was the result of great effort on the part of a number of people, and the programs would not have been possible without them. Beginner's Mindfulness session at the Marguerite Centre in Pembroke. The session, which run from 9.00-10.30am is facilitated by Ray Parchelo and will have a "Buddhist flavour". The session will include 2 rounds of walking practice, a 15-20 minute round of sitting and a 15-20 minute mindfulness exercise. There will be time for Q/A as well. The session, which run from 9.00-10.30am is facilitated by Ray Parchelo. The session will include a warmup of Eight Pieces of Brocade (Qi Gong), 10 minute each rounds of walking and sitting. The main practice lasts about 30 minutes and differs monthly, either indoor or out, depending on the weather. There will be time for Q/A as well. The sessions will cost $5.00, payable in the room on arrival. Sessions are on a drop-in basis and people of all faiths who want to learn/practice are welcome. No experience is required. Swirling pool of headlamp spot floats just ahead. I am happy to report that my book has now been officially announced by the publisher. I'll be posting a book website shortly with the Table of Contents and Preface available. Rain clouds drift by, jealously cling to their cargo. There is a familiar if biased and out-of-date conclusion to Tom Harpur’s commentary in the Observer, Major faiths still share central theme (June 15). As one of the non-Christians he tries to speak for, I cannot agree with him. Further, his argument is weakened by a dubious scholarship and his intentions to create unity are undermined by a presumptuousness that will only put off other faiths. I somewhat agree with him that religion (may) play a sinister role in many conflicts. However, his efforts to demonstrate that: major faiths are like branches stemming from one trunk do little to forward his intent to restore value to all faith traditions. As a lifetime Buddhist, founder of Red Maple, Eastern Ontario’s first lay Buddhist congregation, the first Tendai priest in Canada and Director of Tendai Buddhism in Canada, I believe I can speak for my own faith. Mr. Harpur re-lists four ‘doctrines’ which he claims are common to all faiths. Unless Mr. Harpur is dismissing my Buddhist tradition as a ‘major faith’, he is profoundly mistaken in trying to squeeze its teaching into his four-fold model. Buddhists do not acknowledge a Creator God nor do they accept the notion of an eternal self/soul, and all the linguistic gymnastics Mr. Harpur may attempt will not alter this. Most of his commentary relies on highly questionable propositions of similarity between the Hindu text, the Bhagavad Gita, and sayings attributed to Jesus. This kind of smudging of differences does not establish his point. For example, his quoting of Chapter 10, verse 33 – Of alphabets, I am the letter A and holding that up beside Jesus’s claim to be the Alpha and Omega lifts the quote out of its Hindu context and distorts its meaning. Having myself translated the Gita from its original Sanskrit, I understand that any serious student of Hinduism would know there is a much richer meaning to this. In the same chapter, Krishna also claims to be “the banyan of trees … devouring death .. and the gambling of cheats”, to name a few. Hardly Biblical. Cutting and pasting a few mis-translated similarities cannot disguise the rich differences between faiths. More importantly, this kind of blurring of faiths is more than a little presumptuous and patronizing. The current values of interfaith dialogue encourage us to understand the meaning of another’s faith as they understand it. It is hardly Mr. Harpur’s place to tell me as a Buddhist or Hindu’s in our community what our faith means. We are quite capable of interpreting and understanding our tradition without relying on someone from another tradition to do so. I have been a weekly contributor to the Ask The Religion Experts feature in the Ottawa Citizen for three years. I have been engaged in an interfaith exercise with a Christian minister for most of this year. (go to http://www.realperson.com/DIALOGUE/dialogue-welcome.htm In both of these endeavours, we rely on each other to present our own faith and have learned to enrich our own faith by the insights of the other. Trying to compress the richness of all the world’s faiths into one “perennial wisdom”, especially one which looks suspiciously like Christianity, is about as useful as trying to make all the world’s rainbow of foods taste like white bread. If people in Renfrew or elsewhere wish to understand diversity in faith, it benefits them to encounter the first-hand representatives of those faiths, not relying on superficial and misdirected efforts to roll us all together so that - presto – we all look just like Christians. At dusk, squawking geese race for the setting sun. Great article on the use of mindfulness by an MD in Ottawa. From centuries of shoreline strollers. All washed away without regret.